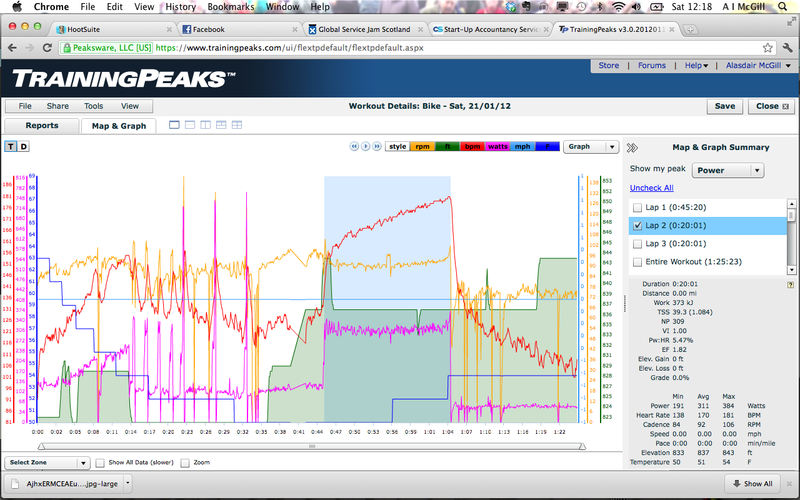 So, today was the first power test of 2012. I was interested to see how I would do, compared to the last test on 31st December, four weeks ago. In the intervening period I’ve been doing strength work, getting regular weights sessions in the gym, and I’ve also lost 4 lbs. I struggled with the Hogmany test, and averaged 301w for the test. Not bad, but I’d hoped for more. To be fair, that was the number from last season, giving me an FTP of 285w. I’ve set myself a goal of increasing this to 300w this season. I was determined to get into “the zone” for the test today. I ate and hydrated well yesterday. I got a good 8 hours sleep, and then my usual porridge and protein shake for breakfast. I picked out my favourite kit (from Shutt VR) and put my race shoes on. All this, to get me in the best frame of mind to take on the 20 minute power test, widely recognised as the most brutal test you can do. For the 20 minute test, I averaged 311w, an improvement of over 3%! I’m absolutely delighted with that. That takes my FTP up to 295w, so I’m now determined to get that up to 310w by the critical racing point in the season for me – May / June. And if I can keep on losing weight too, then the results should be pretty good providing I can translate this to performance on the road. A pretty good Saturday morning. I might even let myself have a beer tonight! It’s great to see good results, makes all the hard work getting there worthwhile and encouragement to go on and do even better next time. Have a cold beer on me! Thanks Steve. The break last autumn was exactly what I needed, I have more motivation that I’ve had for the past couple of seasons and mixed with more experience and the right nutrition, then I’m really excited about the season ahead. That’s a nice looking file Alasdair (and normalized power!) Thanks for sharing the screenshot. Thanks David. It was on the turbo, so easier to maintain a steady cadence / power. The last 5 minutes were hard though!